Michel Fiffe needs little introduction. 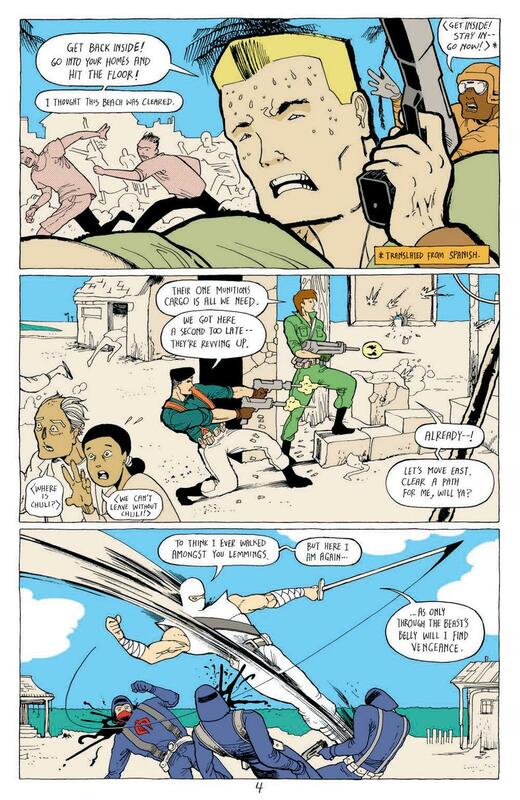 Blazing his way to become an indie auteur with his incredible hit series’ of Zegas and Copra, his name is called alongside any modern comic great. Now, after spreading his wings last year over at Image with Bloodstrike, Fiffe’s latest arrival at IDW to write the Joes seems like the perfect marriage of a classic ‘80s franchise with a creator who has mastered violent, vibrant and psychedelic action. 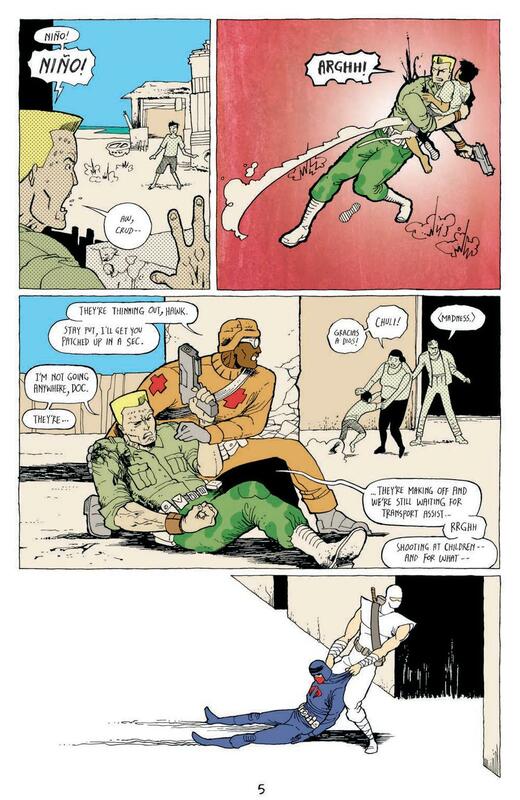 And for any Joe fans seeing Fiffe’s name for the first time, let me assure you right now that your beloved commandos could not be in better hands. In a seemingly stand-alone story, Cobra has found itself a new base in the heart of Sierra Muerte. But with a rapidly deteriorating Cobra Commander in need of a new body and a new way to win, the unexpected arrival of the Joes dangerously accelerates his new, wild plan. Cue an all-out battle with a roster of the most beloved heroes and villains of the franchise, playing out in the well-realized and characterized setting of Sierra Muerte. Fiffe’s desire to blend the legacy of this series’ roots with some decidedly new-age sensibilities really shines in this issue, as a modern tale of violence and war collides with the cheesy, cartoony one-liner portrayal of these characters. 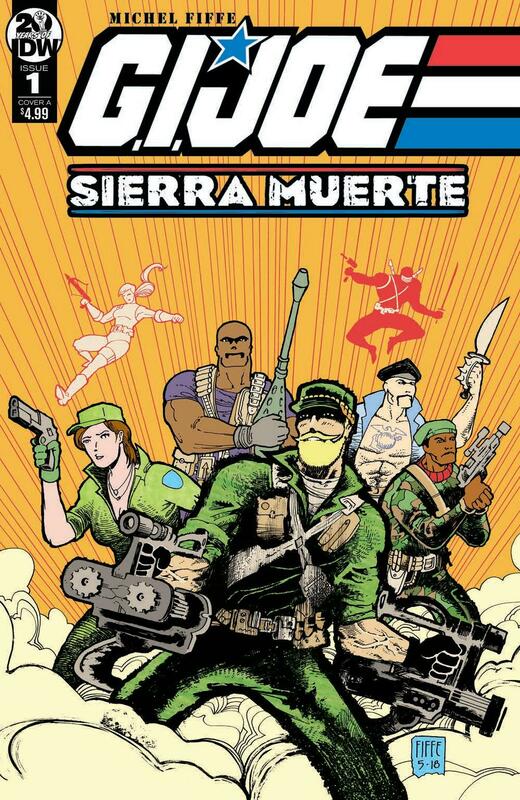 Never clashing as it might first seem, Fiffe crafts both these elements to work in tandem, giving this story of Joes in action in Sierra Muerte real weight and momentum, but never making it grimdark, or removing it from the franchise’s high-octane Saturday morning thrills. It also doesn’t hurt things that all the favourites are here. From Hawk to Gung-Ho, Snake Eyes to Zarana, Fiffe pulls out a massive cast that are bolstered by their classic appearances and mannerisms, with characters feeling as animated and alive as their most famous depictions. 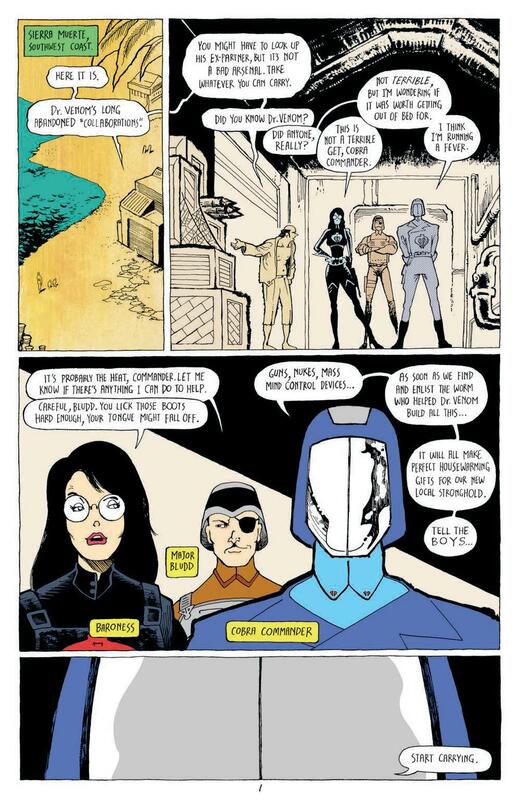 Fiffe also provides his own unique touches to quips, banter and Cobra Commander’s battle cries that make for genuinely laugh-out-loud stuff. And nothing is more visually exciting than seeing each of these over-the-top designs realized in impeccable artwork. 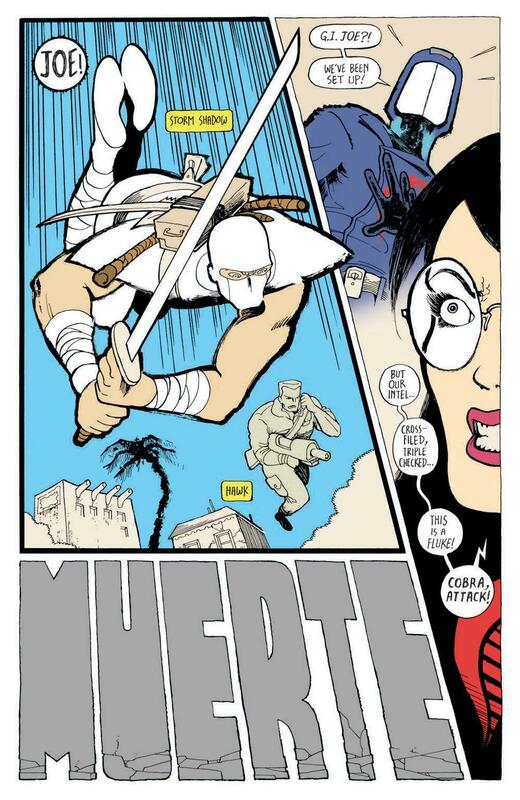 As a result, it’s probably unsurprising that the slick ninja action of Storm Shadow and Snake Eyes jumping and slicing through intricate battle scenes remained my favourite part of the issue. As should be expected, the art here is the complete package. From the eye-popping colours and violence that feel so at home in an ‘80s property, to the intricate lay-outs that make moving your eyes from one panel to the next an absolute joy, the preview below of Fiffe’s art will say more about its quality than I could ever write. But it’s in the Joes themselves and the exciting location of Sierra Muerta that Fiffe really flexes his talent. From blue pastel skies set against a white beachside city, to powerful greens and browns of swampland, city streets at night set against a hazy purple light, and the temples of a new secret base, there’s a reason this series’ title comes from its setting. It’s pure delight that brings everything from Fiffe’s mastery of colour and quick scaling action to make the most exciting of scenes across a swathe of dynamic playgrounds. Chad Bowers also delivers a lovely essay in the back about the importance of geography in G. I. Joe’s action-packed history which I can only hope has a sequel in the next issue. 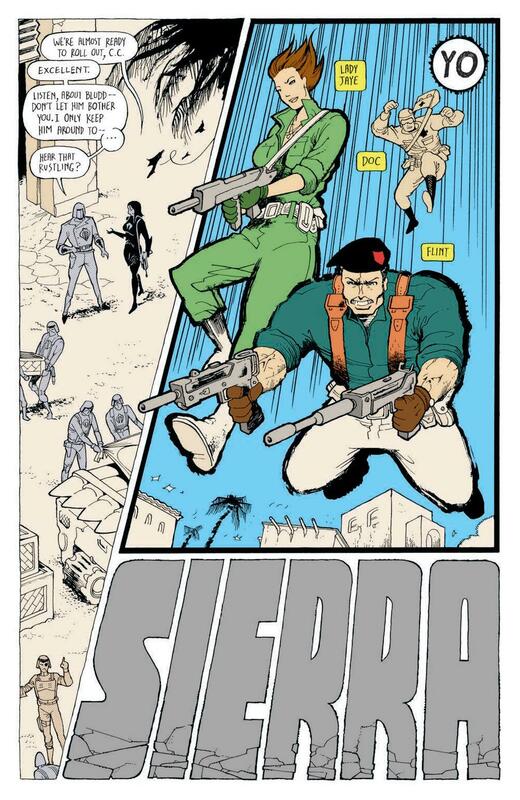 There was always a slim possibility that the pairing of Fiffe and G. I. Joe could end up less than spectacular, but with the understanding and love shown to these characters and an exciting new location to play in, G. I. Joe Sierra Muerta looks and reads even better than I could have hoped. Add in a crazy ending which suggests that we’ve seen nothing of the madness to come, and this first issue stands out as easily the finest action comic on the shelves this week. Issue #2 cannot come soon enough.